The Thiruvidanthai temple was built by Pallavas. It is near Seashore. It has a large temple tank in front of the temple. It is quite an old temple. 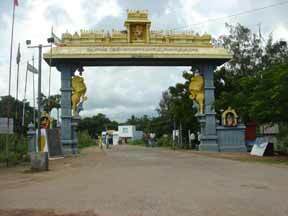 There is a separate shrine for Komalavalli Nachiyar. The Lord here stands on Adisesha and holds his consort on his left side. There is also separate shrine for Andal. The Temple follows Thenacharya Sampradayam. Legend has it thatSage Gavalaa Maharishi had 360 daughters. He was very much worried to get them married. He prayed to Lord Vishnu. The Lord who resides here promised the sage that he would marry one daughter a day and married all the 360 in a year. So the Lord here is called as 'Nithya Kalyana Perumal'. It is also told that Lord then immediately converted all the daughters into one and kept on left lap. Hence the name is called "ThiruVidandai". Sage Markandeya and King Mahabali had visited the kshetram. Even today many pilgrims come here and get the blessings of Lord Nithyakalyana Perumal. Those who wants to get married would be offering two garlands to Lord. After Puja, the priest would give one of the garlands. The person should wear that garland and do Pradakshinam. This is practiced, so that marriage would be fixed soon to the bhaktas. The Annual Brahmotsavam will be conducted during Chittirai Month. Garuda Seva is held during the months of Aani, Aadi, Masi and Thai.